Every day, A-B-C machines are hard at work; case erecting, packing, sealing, palletizing, bulk depalletizing, uncasing on production lines around the world. You can rely on us for quality machines that stand the test of time, supported by comprehensive service and support for the life of your equipment. We’re working to help you meet packaging challenges today and in the future, with machines that offer greater flexibility, faster changeover, and wider product ranges, while making operation simpler and more intuitive than ever before. We meld new technology with proven operating principles for machines that deliver real-world solutions for your packaging needs. - A-B-C's bulk depalletizer's are the solution for packagers who need maximum flexibility to feed empty bottles to one or multiple packaging lines as it runs a wide range of bottle types and styles with no downtime for changeover. - When you need automatic unpacking and single filing from reshipper cases, rely on the industry standard, A-B-C decaser. - Preferred by packagers for their ability to run less than perfect corrugated, these A-B-C case formers are proven leaders in performance and reliability. - Automatically open and insert multi-celled lightweight chipboard partitions into RSC, HSC or Tablock cases utilizing efficient servo technology that ensures positive, high speed reliability. - Gentle product handling and precise operation are key in maintaining maximum package quality, and A-B-C lift and place case packers provide both. - Seal cases at top speeds to 75 cpm and nonstop case feed for reliable high speed for adhesive and tape sealing is why A-B-C's case sealers are best choice for your most challenging case sealing requirements. - A-B-C's low-level palletizers provides gentle product handling, square, secure palletloads, and rapid changeover. The motorized support bar travels with the bottle load during sweepoff, to prevent friction from causing bottle instability. Containers glide from the case to an impact-absorbing belt and remain in their pack pattern, spaced and separate, until single filed with minimum container contact. The ergonomic design of the low level design makes it easy to refill without lifting and raising cases. The major case flaps are gripped firmly as the heavy-duty rear flap tucker folds the inner flap. Automatically opens and inserts multi-celled lightweight chipboard partitions into RSC, HSC or Tablock cases utilizing efficient servo technology that ensures positive, high speed reliability. Pick-and-place case packer loads two cases simultaneously. A-B-C\'s Case packers utilize servo motors to deliver accuracy, speed, and adjustability at speeds to 25 cpm. Built with independent sealing modules for tape or hot melt adhesive application, this sealer changes from one sealing method to another in minutes. Here\'s a top performing palletizer for cases, with features for ultra-smooth case transit, perfect load positioning, and rapid product changeover for all your palletizing needs. The Model 108RT is the only sweep style depalletizer that runs reverse taper wine bottles, with proprietary features to ensure top bottle stability. compact Model 49 decaser / single filer designed for high speed unloading of reshipper cases to ensure a continuous supply of empty bottles to your production line. This decaser has the versatility to run glass bottles from RSC, HSC or RSC-tablock style cases and offers quick and easy changeover. The 49 decaser / single filer is designed for high speed unloading of reshipper cases to ensure a continuous supply of empty bottles to your production line. Partition opener with a dual servo-powered partition handling device and no-tools changeover, this partitioner ensures top production from your packaging line. Dual Head Model 70 delivers double the volume of the single-head model for maximum performance and flexibility on your line. 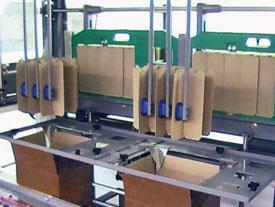 Gentle product handling and precise operation are key in maintaining maximum package quality. Designed with innovative features to maintain total bottle control during depalletizing, and built for long-term production, this depalletizer is the solution for bottle handling productivity. See how simple and reliable case erecting can be with this workhorse machine. This 2-in-one design simultaneously uncases empty bottles from reshipper cases while place packing full wine bottles, utilizing only one machine, in one location, with no labor. 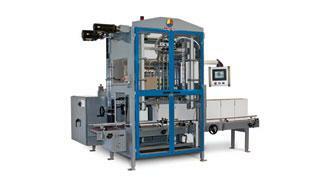 This innovative machine will increase line productivity by eliminating manual uncasing and case packing. A-B-C's case sealer is designed to deliver value and performance to 15-25 cpm lines. “Responding to customer requests, we designed this case sealer to bring A-B-C’s high Model 236 top case sealerend performance to midrange packaging lines at a price point that makes it easy to justify,” said Bryan Sinicrope, VP, sales & marketing at A-B-C. Inside its solid frame (8’ long), this case sealer incorporates A-B-C’s proven features to ensure reliable, long-term production. The metering roller feed accepts cases back-to-back or spaced and automatically aligns with changing line speeds. The powered minor flap tucker ensures positive inner flap closing and the outer flaps are closed by contoured flap folders that fold the flaps squarely even when running cases with poor or undefined scores. Installation is simplified using the adjustable footpads (+/= 2”) to align to conveyor height and changeover can be completed in minutes with only 3 simple adjustments.The sealer’s frame is fabricated of heavy painted steel in a box style with all upper operating mechanisms secured to the frame with a sturdy rack and gear system. The standard machine includes clear sliding panels that combine total visibility and protection as they stop production when opened. The Model 236 is available in tape and adhesive sealing models. The tape sealing Model 236T has an easy access tape head for quick and easy replacement. The adhesive sealing Model 236 has a sealing section with rollers that compress against each case to ensure secure adhesive bonding even when running cases with minor case height variations. 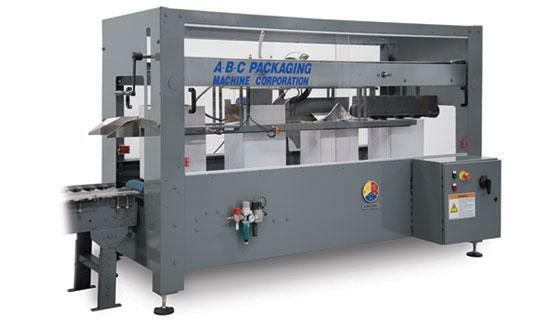 A-B-C's Model 70 partition opener/inserter with a dual servo powered partition handling device and no-tools changeover. The twin servos drive the partition indexing/opening and inserting, blending these two independent steps into one harmonious action that ensures gentle handling for smooth opening, precise placement and efficient case packing. Lateral stabilizers square the partition after opening to “lock” the partition’s interlocking panels and ensure smooth insertion into the waiting case or tray. 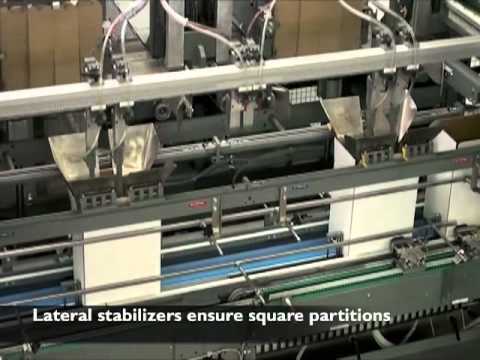 A video on A-B-C’s website shows the Model 70 partition opener/inserter in operation. Changeover time is dramatically reduced up to 70% due to the new design that requires no tools or change parts for a complete range of partitions. All parameters are stored for immediate recall at the control console, and position indicators eliminate guesswork in adjusting to new settings. The operator just follows the step-by-step instructions to set the new parameters, and the machine is ready for return to production. To run new partitions, the operator simply inputs the parameters at the touchscreen display then stores the data for future changeovers. A-B-C offers an automated packaging solution for processors who manually unpack and repack bottles in reusable (reshipper) cases. It’s a compact, all-in-one machine that performs both uncasing and case packing with every motion of the servo-operated robotic-style transfer head. The Model 360 eliminates manual labor, provides gentle handling, and ensures a consistent bottle feed to the production line–at a conservative cost. Here’s how it works: cases filled with empty bottles are fed on a conveyor to the Model 360. 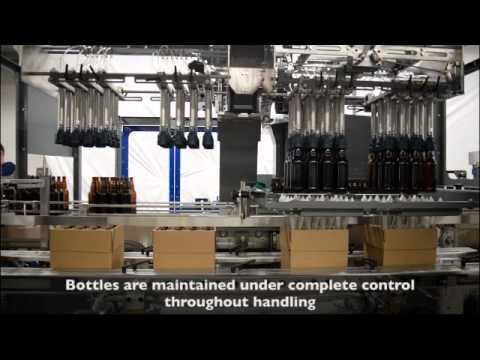 In every cycle, two separate actions occur: the unpacking head grips and lifts the empty bottles and places them on the conveyor to be transferred to filling, while the packing head picks up and packs finished bottles feeding from the production line into the emptied case. The servo-operated transfer head smoothly and efficiently carries containers with no drop and keeps them under complete control during operation…bottles are released only when they reach the bottom of the case during packing, or the conveyor for unpacking. The Model 360 uncases and packs glass or plastic bottles in a variety of sizes at speeds to 15 cases per minute. Its 2-in-1 footprint saves money by reducing the floor space and machinery investment when compared to the size and cost of separate uncasers and case packers. A-B-C’s 700 series robotic palletizers are designed to deliver the flexibility of manual palletizing with reduced costs and liability as these machines automatically accumulate and stack cases, trays, bags or shrink-wrapped multipacks in multiple configurations and pallet loads. Packagers can achieve efficient and reliable pallet forming while utilizing less floor space, and ship secure, well-formed pallet loads that protect products throughout distribution. All systems are OEM-engineered and manufactured and supported by A-B-C’s professional service technicians. Standard systems include a high payload robot and appropriate product handling devices for single or dual infeed and pallet building, product transport and staging conveyors, high visibility guarding, Allen Bradley controls and programming for product requirements. Additional pallet patterns are easily programmed by the end user and uploaded at the operator panel for seamless transition to new products or packs. The pallet programming software automatically sets the most efficient arm movement to maximize palletizing speed. A variety of end-of-arm tools are available to accommodate all product types. 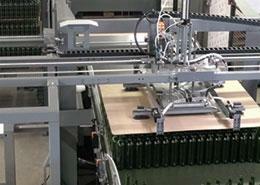 Options include automation of empty pallet transfer and slipsheet/picture frame inserting. 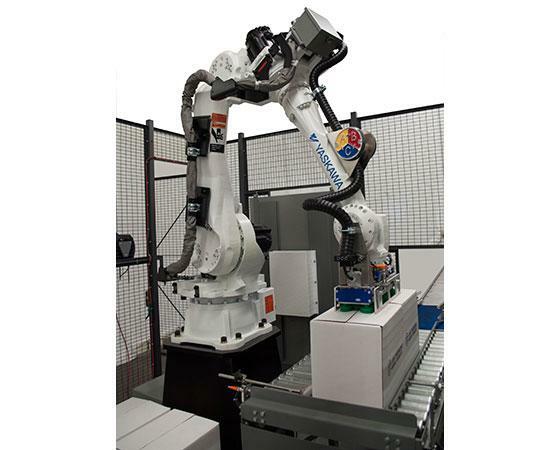 Robotic control or separate devices may be integrated depending on speed and space requirements. A variety of full pallet takeaway conveyor options are also offered. For plants with either limited floor space or a small budget, this compact palletizer (Model 72AN) offers a simple and economical solution to increase production and eliminate the cost and liability of manual operation. It occupies from 10 to 30% less floor space than conventional low level palletizers depending on the accessories required (transfer conveyor, pallet dispenser/transport) and offers complete flexibility for product feed and pallet configuration. All operation is automatic which eliminates the risk of employee injury and related costs from repetitive palletizing actions. No pallet dispenser is required for the Model 72AN. Up to 5 empty pallets can be stacked in the load area for palletizing and the layers of product are automatically directed to the top pallet level. Once the load is completed, the lift truck operator simply removes the top pallet and contents, and the palletizer continues to load the next pallet; once all pallets have been loaded and removed, the operator simply stacks another set of empty pallets in the loading area and the sequence repeats. This palletizer offers the freedom of on-floor operation with an open profile and full machine guarding, plus high or low level product feed. It is designed for long term operation with heavy steel frame construction, reinforced and counterweighted elevator table, and a dual, chain-driven layer transfer mechanism. A-B-C’s intelligent control package offers simple, touchscreen control of operation, changeover, production data and diagnostics. A-B-C’s Model 156 decaser / single filer is equipped with an Intelligent Control package that automatically monitors container flow and adjusts the decasing speed to ensure a continuous fill rate. 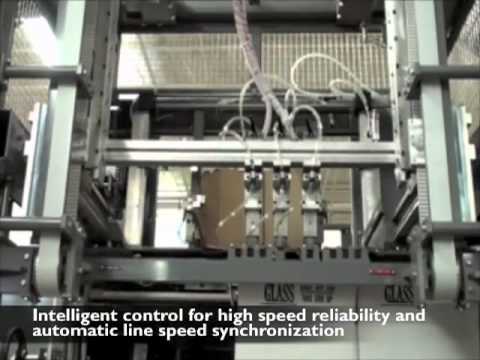 This feature is designed to optimize line productivity by ensuring harmonious operation regardless of line speed variations. The Model 156 takes the place of three machines as it functions as a flap opener / positioner, uncaser, and container single filer. Operating at speeds to 50 cases per minute, it opens the case flaps, uncases and single files the containers, and uprights the emptied cases for conveying to case packing. Flexibility is built in, as this machine runs a variety of bottle or container styles including glass and plastic, and offers quick changeover requiring no change parts. To maintain container integrity, the Model 156 uncases containers with no drop, and single files with minimum bottle-to-bottle contact. This operation offers advantages whether running plastic or glass, ensuring stability of even lightweight plastic bottles, and eliminating scratching and starring in glass that can lead to breakage downstream. No longer is adhesive sealing the only option for packagers running high speed lines, with the Model 436T sealer that seals cases with tape at speeds to 50 cases per minute. 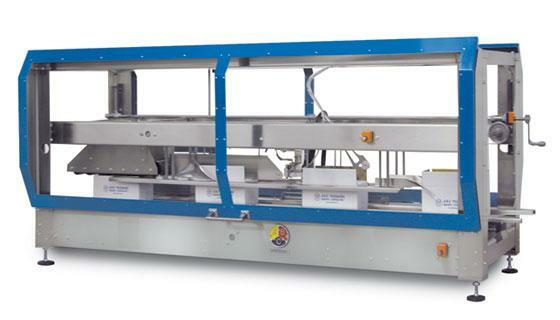 This tape sealer provides automatic case feed and spacing, and squares cases as the tape is applied, for square, securely sealed cases that form straight, stable palletloads. Packed inside its rugged stainless steel frame are a host of production-proven components that provide continuous and reliable high speed operation, including the metering belt case feed powered by a substantial 1 hp motor that ensures precise case transfer for synchronized flap folding and sealing. The rotary flap tucker smoothly breaks the score of the leading inner flap for accurate folding and securely tucks the trailing flap. A-B-C’s exclusive contoured, cast aluminum flap folders fold the outer flaps precisely on the scoreline. The tape system is designed for minimum downtime, with the tape head mounted outside the machine frame for quick and easy tape roll changes. A “roll empty” sensor eliminates tape head rethreading- the sealer stops when the roll is depleted, and the new roll can be simply attached to the end of the previous roll. Clear, high visibility gull wing doors enclose the machine and stop the sealer when opened to allow quick access to all operating components. The Model 436’s compact design (10’ long) and wide case range (Min: 8”L x 6”W x 4” H Max: 24”L x 17”W x 17”H) provide line flexibility for today and the future. Manufacturers will maintain optimum package quality with the gentle handling and precise operation provided by A-B-C's pick and place case packer which features a streamlined design and servo-operated machine drive. 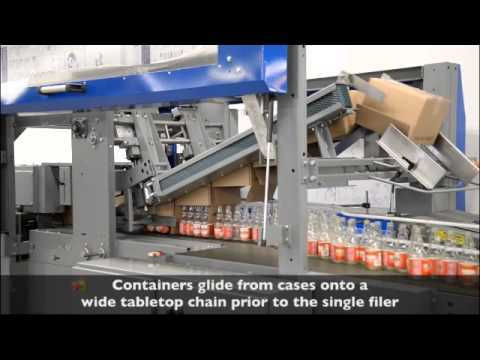 This versatile machine automatically collates and packs glass or plastic containers, aluminum cans, composite containers or cartons with a synchronized motion that maintains full control of the products from conveyor to case with no drop, protecting product labels and graphics. A unique feature of this packer is a gripper head that automatically spaces containers after pick-up to accommodate case partitions. Changeover is simplified with snap off individual gripper heads that eliminate the need for expensive gripper head assemblies for each packing arrangement…simply reposition the gripper heads for the new pack, and resume operation. Containers are fed by motorized conveyor to the packing station, where a release mechanism removes backpressure that could cause product damage or label scuffing. Once the load station is filled, the product grippers lower and grip each product in the load; lifting the entire load for packing. During the arc into the case, the product iautomatically shifted to accommodate case partitions, ensuring that each individual product slides neatly into the case cell. After the product reaches the bottom of the case the grippers release and cycle to pack the next product load. In the meantime, the filled cases are indexed to case sealing and empty cases are positioned for packing. Taking the next step to high-speed case forming performance is simplified by A-B-C’s Model 450 case erector. “This case erector offers features to ensure smooth, high volume operation including a servo-operated compression ram and substantial 3 hp main drive motor, plus solid construction, all-mechanical continuous motion drive, high capacity vacuum system, and A-B-C’s intelligent control package,” said Bryan Sinicrope, vice-president, sales and marketing. The Model 450 has a large capacity kd case magazine that ensures non-stop operation, as it automatically indexes kd stacks when needed, and may be refilled at any time without lifting cases. Optional case magazine extensions are available to allow additional kd capacity. Features for high speed production include the walking beam case drive which automatically squares cases as they are transferred through the erector, and the servo-operated sealing ram that ensures top precision during compression. A-B-C’s Intelligent Control makes high-speed operation automatic and provides real-time operating data, comprehensive production reports, and enables independent operation of all functions, diagnostics, and changeover settings. The erector is built with a solid, welded and bolted steel frame for long-term operation without vibration. It erects and seals RSC and HSC cases at speeds to 50 per minute. The compact design of the Model 450 (only 16’-9” long) allows easy installation on most packaging lines. A-B-C’s Model 70 Dual-Head Partition Inserter opens and inserts up to 50 partitions per minute, while cycling at a conservative 25 cycles per minute, providing high speed performance while minimizing machine operating expense and wear. This partitioner incorporates many features and an expanded range of partition styles, making it the solution for food and beverage bottlers and bottle suppliers serving multiple markets with diverse product packaging. 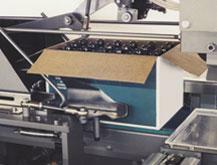 The Model 70 runs both chipboard and corrugated partitions with 6, 12, 15, 18, 24 and 48 cells. It runs Air cell 6-packs, ‘A’ cell 6-packs, and all standard locking partitions including ‘Q’ lock, center locking, and top and bottom lock. The partitioner’s servo-operated insertion heads ensure precise partition selection from the magazine and placement into the case. Tools-free, repeatable changeover is another new feature. Simple hand cranks are simply turned to the correct position according to the position indicators, and most size adjustments are completed with no change parts. No change parts are required to switch from right hand to left hand partitions. The machine’s touchscreen operator station uses “intelligent control” to make speed and motor function settings automatic, simply by choosing from pre-set options. The partitioner may be equipped with locking casters, quick disconnect air and electrical connections for easy portability in multi-line operation. For lower speeds (to 35 cpm), a single head model is offered. A-B-C’s exclusive Model 156 decaser / single filer is now equipped with an Intelligent Control package that automatically monitors container flow and adjusts the decasing speed to ensure a continuous fill rate. This feature is designed to optimize line productivity by ensuring harmonious operation regardless of line speed variations. A-B-C offers a simple solution for wine processors who need to cut the tabs of tablock cases, then fold and seal the top flaps, in high speed, continuous operation. 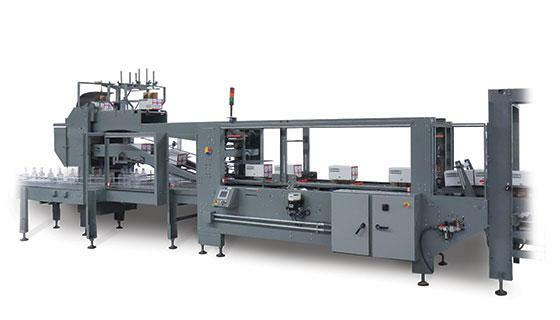 The Model 121S is two machines in one– a tab slitter and top case sealer– with a streamlined design that facilitates quick installation on the packaging line, and consistent operating speeds to 50 cases per minute, making it the production solution for high-speed beverage lines. From start to finish, the Model 121S provides positive case control which is critical for successful high-speed operation. The metering belt infeed ensures proper case spacing, and high traction transfer belting provides positive case transfer. As the case travels, the slitter mechanisms move on sliding rods to lift the flaps and cleanly cut the tabs. Four flap control and closing is accomplished by a combination of mechanical and fixed flap folders. The compression section has top and bottom belt drives for secure case sealing. Spring-loaded rollers support the top belt to ensure proper sealing of every case regardless of minor height variations. Built for the rigors of high speed operation, the Model 121S is equipped with top quality components including self-lubricated air cylinders, automatic water eliminator, maintenance-free sealed bearings, and cast aluminum flap folders. The stainless steel frame is welded and bolted for strength, and machine guards offer high visibility for monitoring machine operation. A tape-sealing model is available. Wine and spirits manufacturers concerned with maintaining maximum package quality are assured gentle handling and precise operation with A-B-C's Model 101 no-drop case packer. A new streamlined design and optimized machine drive make the Model 101 packer superior for packing bottles, ensuring precise product placement and eliminating container damage or label scuffing. Snap Off gripper heads make changeover easy, eliminating the need for expensive gripper head assemblies for each packing arrangement. As bottles are fed by motorized conveyor to the packing station, the packer utilizes a release mechanism to eliminate back pressure that could cause product damage or label scuffing. Once the load station is filled, the product grippers gently cycle and lift the entire load for packing. During the arc into the case, the product is automatically shifted to accommodate case partitions, ensuring that each individual product slides neatly into the case cell. After the product load reaches the bottom of the case the grippers release and cycle back for the next product load. In the meantime, the filled cases are indexed to case sealing and empty cases are positioned for the next pack load. This machine may also be utilized as a case unpacker. Reverse taper bottles can present a depalletizing challenge because their smaller base configuration causes instability during transfer. A-B-C has introduced the Model 108RT, a depalletizer with proprietary features that maintain bottle stability for reverse taper bottles during high speed transfer from the pallet and throughout single filing. These features include devices that square and secure the top pallet layer and also the secondary layer prior to container transfer, and maintain the slipsheet firmly as the top layer is swept from the pallet to the loading table. In addition, each product load is kept under control on all four sides from the pallet throughout the depalletizing process, to contain the bottles in a tight pack, which enhances stability. 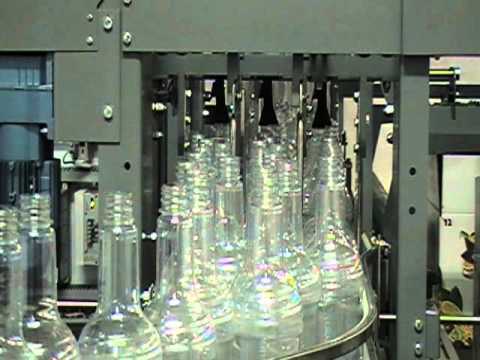 Bottles are single filed with a conveyor designed to gently “pull” them from the pack and guide them to the line conveyor. Picture frames and slipsheets are automatically removed, separated and stacked. The depalletizer’s compact design provides economical floor level operation and offers low, medium, or high level discharge. The open profile ensures high visibility of all operation and easy access for maintenance. Built for reliable, long-term operation, this depalletizer has a solid channel steel frame and welded and bolted construction. The transfer table is crafted of stainless steel for smooth container transfer. Additional performance features include heavy shafts and industrial roller chain for the sweep drive and elevator drive. Operation and changeover are managed at the touchscreen operator panel which provides access to real-time operating data, diagnostic reports, and full machine manuals. No longer is adhesive sealing the only option for packagers running high speed lines, with the Model 436 sealer that seals cases with tape at speeds to 50 cases per minute. This tape sealer provides automatic case feed and spacing, and squares cases as the tape is applied, for square, securely sealed cases that form straight, stable palletloads. In this day of labor shortage, wineries are seeking solutions to manage this difficult situation. A-B-C Packaging helps wineries looking to reduce labor, eliminate liability and reliably feed bottles whether received in reshipper cases or bulk palletloads. For over fifty years, they have been at the forefront of providing decasing and depalletizing solutions to wineries across the country. Made in Florida, their USA-based operation provides two excellent solutions for different production line needs. Buying glass in reshipper cases is the best option for many wineries, but manual case unloading is a labor-intensive job with risk of repetitive motion injuries for workers. That’s where A-B-C’s decasers can help, providing automatic unloading and bottle single filing, with the added benefit of minimum bottle contact to maintain glass integrity. Reducing labor costs as well as the risk of injury and liability, this decaser can be your best new winery investment. Wine glass started seeing a change in the early 1980’s, when bulk bottle handling was emerging in the U.S., after it had gained acceptance in Europe. Early depalletizers from A-B-C included a semi-automatic model that allowed an operator to manually guide layers from pallet to unloading table. 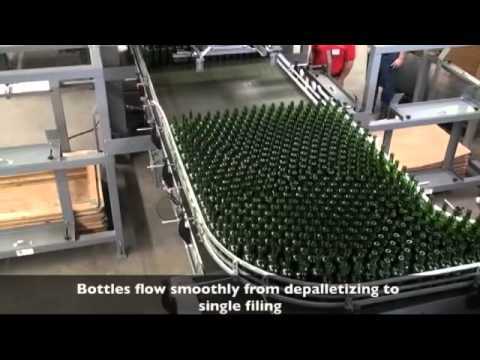 Today, A-B-C depalletizers are fully automatic and run reverse-taper and non-standard bottles as well as standard wine bottles. 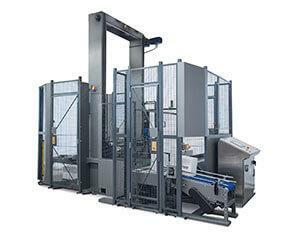 The efficient design and high quality of their depalletizers ensure that high-volume production is entirely reliable. 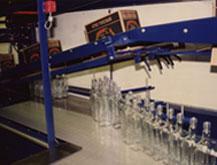 In bulk glass handling, pallet layer stability and bottle integrity are critically important, and A-B-C depalletizers are designed to ensure both–with exclusive four-sided layer squaring of both the primary and secondary layers during sweep-off, ensuring perfect load positioning and maximum bottle stability. “Our commitment to the wine industry is longstanding and we are proud to serve many major wineries in North America,” says Sinicrope. A-B-C equipment is supported by a professional service network throughout North America. Supplying a complete line of secondary packaging machinery from case erectors to palletizers, A-B-C is a full service resource to help wineries run more efficiently and effectively. For more information, visit us online at www.abcpackaging.com or call Bryan Sinicrope, A-B-C Packaging at 727-937-5144 or 800-237-5975. – A-B-C’s exclusive Model 156 decaser / single filer is now equipped with an Intelligent Control package that automatically monitors container flow and adjusts the decasing speed to ensure a continuous fill rate. This feature is designed to optimize line productivity by ensuring harmonious operation regardless of line speed variations. A-B-C’s Model 335 case erector gives packagers optimum flexibility to erect and seal regular slotted (RSC), half slotted (HSC), and tablock cases. Case style changeover is easy, requiring minimum downtime and no change parts. The innovative tablock module is key to the quick changeover capability…when running tablock cases the module operates to fold the tablock flaps smoothly and eliminate tab stress…when running other case styles, the cases simply bypass the tablock section to be erected and sealed as usual. 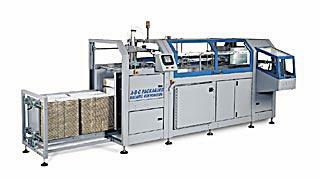 The Model 335 offers high speed, mechanical operation, erecting and sealing up to 35 cases per minute. Intelligent machine control is a standard feature, providing accurate PLC/electronic control and supervision of operation. The variable speed drive automatically adjusts the machine to accommodate line fluctuations and maintain top productivity. The compact size of this case erector saves valuable floor space; at only 19’ long, the Model 335 occupies 30% less floor space than other tablock-style case erectors. Yet at this small size, the machine includes a large capacity case magazine that is low level for easy loading, and indexes case stacks automatically for uninterrupted case feed and minimal operator attention. Cases can be loaded at any time during operation. A-B-C manufactures a complete line of packaging machinery including case erectors, sealers, packers, decasers, bulk depalletizers, and palletizers. A-B-C's case sealer is designed to deliver value and performance to 15-25 cpm lines. “Responding to customer requests, we designed this case sealer to bring A-B-C’s high end performance to midrange packaging lines at a price point that makes it easy to justify,” said Bryan Sinicrope, VP, sales & marketing at A-B-C. Inside its solid frame (8’ long), this case sealer incorporates A-B-C’s proven features to ensure reliable, long-term production. The metering roller feed accepts cases back-to-back or spaced and automatically aligns with changing line speeds. The powered minor flap tucker ensures positive inner flap closing and the outer flaps are closed by contoured flap folders that fold the flaps squarely even when running cases with poor or undefined scores. Installation is simplified using the adjustable footpads (+/= 2”) to align to conveyor height and changeover can be completed in minutes with only 3 simple adjustments. The sealer’s frame is fabricated of heavy painted steel in a box style with all upper operating mechanisms secured to the frame with a sturdy rack and gear system. The standard machine includes clear sliding panels that combine total visibility and protection as they stop production when opened. 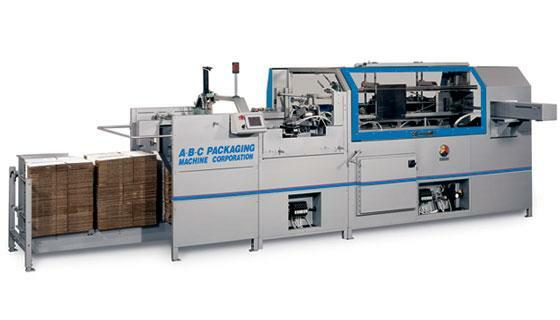 You need a workhorse machine to feed, erect, and seal corrugated cases every 1.1 seconds, shift after shift, and A-B-C’s Model 450 is a heavy duty, production-proven unit to handle this challenge. From the ground up, this machine is built for speed­­­; inside its solid steel, welded and bolted frame is a continuous motion case drive powered by a hefty 3 hp motor, high capacity vacuum case system, and servo case sealing compression ram that ensures non-stop sealing. The large capacity case magazine is self-indexing to maximize time between refills, and case magazine extensions provide additional kd capacity. The case magazine’s low level design makes it easy to replenish without lifting cases. The 450 is loaded with features to accommodate less than perfect cases. The opening arms “over-open” the major flaps to compensate for incorrectly slotted cases, and the vacuum cups grip each case from above and below to compensate for warped cases and ensure proper opening. A-B-C’s exclusive walking beam case drive automatically squares cases as they are transferred through the erector, and the servo-operated sealing ram ensures top precision during compression and forms square, well-sealed cases. A stainless steel case discharge chute automatically uprights the case to the buyer’s supplied takeaway conveyor. A-B-C’s Intelligent Control makes high-speed operation automatic and provides real-time operating data, comprehensive production reports, and enables independent operation of all functions, diagnostics, and changeover settings. It erects and seals RSC and HSC cases at speeds from 20 to 50 per minute. 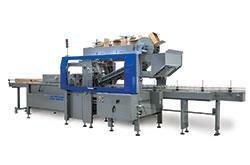 At only 16’-9” long, this erector is easily installed on most packaging lines. Wineries who receive their bottles in necks down reshipper cases can automate their hand dumping operation, reduce costs, increase line speeds, and ensure a consistent bottle supply to their filler with A-B-C’s Model 49 decaser. The Model 49 accepts cases from the conveyor either back-to-back or spaced, unloads and single files the bottles, and uprights the empty cases for transfer to case packing. 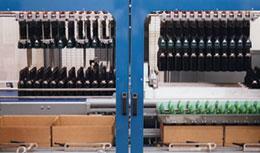 Bottles glide from the case to the impact-absorbing transfer belt and bottle contact is minimized with A-B-C’s unique single filing module. These features work to maintain bottle stability and protect the glass integrity. By replacing the hand dumping operation, the decaser eliminates the related risk of employee injury from repeated lifting and emptying of heavy cases. The Model 49 has special features to accommodate case size variations, including a soft roller system that utilizes an automatic tensioner to ensure smooth case transit throughout decasing. The 180-degree case turnover securely holds the cases as they are oriented before discharge. The Model 49 runs RSC, HSC, and RSC tablock cases at speeds to 50 cpm, and offers quick and easy changeover. 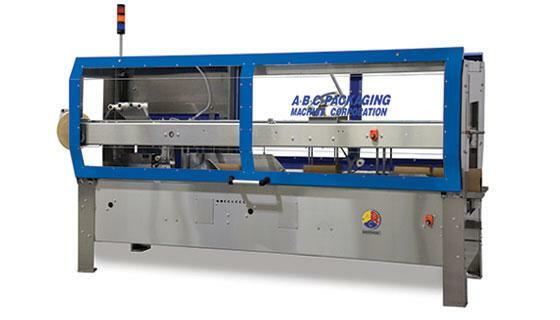 A-B-C’s Model 70 partition opener/inserter has a dual servo powered partition handling device and no-tools changeover. The twin servos drive the partition indexing/opening and inserting, blending these two independent steps into one harmonious action that ensures gentle handling for smooth opening, precise placement and efficient case packing. Lateral stabilizers square the partition after opening to “lock” the partition’s interlocking panels and ensure smooth insertion into the waiting case or tray. A video on A-B-C’s website shows the Model 70 partition opener/inserter in operation. 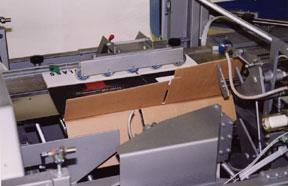 Tablock cases are commonly used where flap control is necessary during drop packing operations. A-B-C offers a versatile case erector and bottom sealer (Model 335) that does the work of two machines– it automatically erects and seals Tablock cases and also runs regular slotted (RSC), half slotted (HSC), HSC cases with integral divider, and center special slotted (CSSC) cases. Key to its multipurpose performance is the built-in Tablock flap folding module that folds and crimps the Tablock flaps smoothly yet flips into bypass mode for sealing other case types, requiring no change parts or downtime. The Tablock forming module occupies only four linear foot of floor space, making this a compact machine that is 30% smaller than other Tablock erector/sealers. The former offers fixed or variable speed operation to match line speed, one of many features offered with A-B-C’s Intelligent Controls that provide touch screen management for easy set-up, operation and diagnostics. The control system provides all operating data at the user’s fingertips, including case count, sensor input/output status and internal program status. All machine functions may be operated independently from the touch screen. The Model 335 offers a low level case magazine with an ergonomic design that makes refills simple without lifting and raising cases. It is equipped with a built-in auxiliary magazine that assures a continuous supply of cases to the erector, minimizing the attention of line personnel. Features for high speed production include the walking beam case drive which automatically squares cases as they are transferred through the erector, and the servo-operated sealing ram that ensures top precision during compression. A-B-C’s Intelligent Control makes high-speed operation automatic and provides real-time operating data, comprehensive production reports, and enables independent operation of all functions, diagnostics, and changeover settings. The erector is built with a solid, welded and bolted steel frame for long-term operation without vibration. It erects and seals RSC and HSC cases at speeds to 50 per minute. The compact design of the Model 450 (only 16’-9” long) allows easy installation on most packaging lines. Manufacturers will maintain optimum package quality with the gentle handling and precise operation provided by A-B-C's pick and place case packer which features a new streamlined design and servo-operated machine drive. This versatile machine automatically collates and packs glass or plastic containers, aluminum cans, composite containers or cartons with a synchronized motion that maintains full control of the products from conveyor to case with no drop, protecting product labels and graphics. A unique feature of this packer is a gripper head that automatically spaces containers after pick-up to accommodate case partitions. Changeover is simplified with snap off individual gripper heads that eliminate the need for expensive gripper head assemblies for each packing arrangement…simply reposition the gripper heads for the new pack, and resume operation. Containers are fed by motorized conveyor to the packing station, where a release mechanism removes backpressure that could cause product damage or label scuffing. Once the load station is filled, the product grippers lower and grip each product in the load; lifting the entire load for packing. During the arc into the case, the product is automatically shifted to accommodate case partitions, ensuring that each individual product slides neatly into the case cell. After the product reaches the bottom of the case the grippers release and cycle to pack the next product load. In the meantime, the filled cases are indexed to case sealing and empty cases are positioned for packing. Packagers who need to run multiple sizes and packs of bottles will appreciate the quick-change features of the Model 101 case packer that can reduce downtime up to 30% compared to conventional changeover practices. This packer is designed with complete gripper assemblies for all pack/bottle patterns that each packager requires to eliminate time-consuming gripper adjustment, and guide rail placement is simplified with sliding and locking handles to allow quick adjustment to the new specification. In three steps, the changeover is completed: 1- unbolt and replace the gripper assembly, 2- slide product guide rails to new settings, 3- select the new container style at the operator control panel, which activates the proper machine actions for the new product/case handling. Setup testing is virtually eliminated, further reducing changeover downtime. 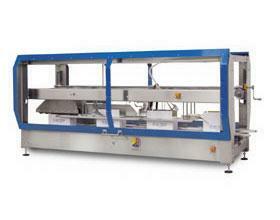 A-B-C’s Model 236 case sealer is designed to deliver value and performance to 15-25 cpm lines. “Responding to customer requests, we designed this case sealer to bring A-B-C’s high end performance to midrange packaging lines at a price point that makes it easy to justify,” said Bryan Sinicrope, VP, sales & marketing at A-B-C. Reverse taper bottles can present a depalletizing challenge because their smaller base configuration causes instability during transfer. A-B-C's Model 108RT, a depalletizer with proprietary features maintain bottle stability for reverse taper bottles during high speed transfer from the pallet and throughout single filing. These features include devices that square and secure the top pallet layer and also the secondary layer prior to container transfer, and maintain the slipsheet firmly as the top layer is swept from the pallet to the loading table. In addition, each product load is kept under control on all four sides from the pallet throughout the depalletizing process, to contain the bottles in a tight pack, which enhances stability. Bottles are single filed with a conveyor designed to gently “pull” them from the pack and guide them to the line conveyor. Picture frames and slipsheets are automatically removed, separated and stacked. 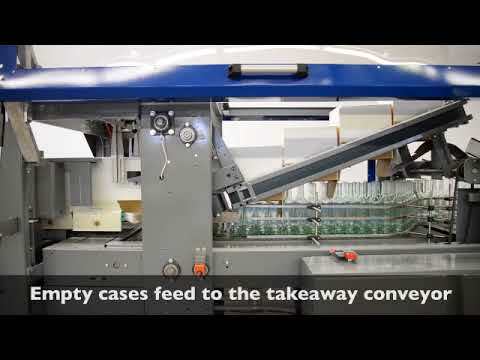 Case size variations are no problem for the Model 49 decaser, which automatically unloads glass or plastic bottles and containers from necks-down reshipper cases, single files the containers and uprights the emptied cases to be conveyed to the case packer at speeds to 75 cases per minute. The new “soft roller” system that transfers cases through unloading utilizes an automatic tensioner combined with soft compression rollers to accommodate varying case dimensions and ensure smooth and gentle case transfer. The case turnover offers finger-style grippers that bend to hold cases securely during 180 degree transfer to the overhead discharge conveyor. The fingers “bend” to grip the cases, easily adjusting to cases that are slightly smaller or larger than spec. These features are standard on the new Model 49 case unloader, and available as a conversion kit for earlier A-B-C unloader models. The Model 108RT is the only sweep style depalletizer that runs reverse taper wine bottles, with proprietary features to ensure top bottle stability. With smooth electric operation and soft start, soft stop layer control, this depalletizer will maximize your line productivity. 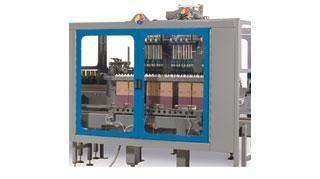 Run a wide range of specialty wine bottles -on the same machine, with no tools changeover. A-B-C’s 700 series robotic palletizers are designed to deliver the flexibility of manual palletizing with reduced costs and liability as these machines automatically accumulate and stack cases or shrink-wrapped multipacks in multiple configurations and pallet loads. Packagers can achieve efficient and reliable pallet forming while utilizing less floor space, and ship secure, well-formed pallet loads that protect products throughout distribution. All systems are OEM-engineered and manufactured and supported by A-B-C’s professional service technicians. Standard systems include a high payload robot and appropriate product handling devices for single or dual infeed and pallet building, product transport and staging conveyors, high visibility guarding, Allen Bradley controls and programming for product requirements. Additional pallet patterns are easily programmed by the end user and uploaded at the operator panel for seamless transition to new products or packs. The pallet programming software automatically sets the most efficient arm movement to maximize palletizing speed. A variety of end-of-arm tools are available to accommodate all product types. A-B-C’s 700 series robot palletizers effortlessly palletize cases, trays, or bags in multiple configurations and deliver the flexibility of hand palletizing with no labor costs or liability. Packagers can achieve efficient and reliable pallet forming for all product types, and ship secure, well-formed pallet loads that protect products throughout distribution. Robot palletizing systems can reduce production costs as they have low maintenance requirements, and require less downtime as product changeovers are completed quickly at the operator station. Their compact layouts can reduce installation costs whether planning a new palletizing line or retrofitting an existing line. Standard systems include a high payload robot with a vacuum head for single or dual feed, product transport and staging conveyors, high visibility guarding, Allen Bradley PLC controls and programming for your product requirements. Also on display are a high-speed case erector, midrange case erector, case sealer and low level palletizer at Pack Expo booth N-5306. The simplicity of low level operation and the flexibility of low or high level container discharge. Automatic unpacking and single filing from reshipper cases. For Multi-Celled Partitions- Single and Dual Head Models. A pick and place case packer that provides smooth and gentle product handling to maintain optimum package integrity. Case sealer built with interchangeable sealing modules that make it easy to convert from adhesive to tape. A-B-C palletizers offer the freedom of on-floor operation, clean, open profiles and high or low level case feed. Sparkling wine producer Domaine Chandon, Yountville, CA, is reaping big benefits from a new case packer it installed earlier this year. Says Jim Takahashi, manager, purchasing and production quality assurance, "Five employees were required for hand-packing bottles of sparkling wine, and at best, eight percent of the bottles were suffering from label scuffing during packing. We decided the solution to these problems would be an automatic case packer." Pick-and-place case packer loads two cases simultaneously. 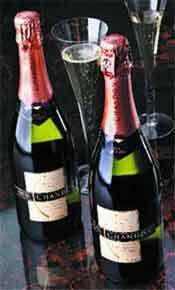 Pneumatic inflating bladders handle wine bottles gently, without damaging corks, wire hoods or foil, and essentially eliminate label scuffing during the packing process. Takahashi investigated a number of different types of case packers and settled on a Model 101 pick-and-place machine from A-B-C Packaging Machine Corp. that was installed last February. "We tried some drop packers and wraparound packers, but we found drop packers too worrisome for a heavy, pressurized product packed in glass, with too great a potential for breakage. Wraparound case packers would press the bottles together so the labels would get scuffed," says Takahashi. The unique design of reverse taper bottles, narrow at the base and wide at the top, is a favorite with consumers of premium wines and spirits. Yet these containers have always presented a challenge for packagers because of their instability during handling. Usually, pallets of these bottles were either depalletized manually or by utilizing a lift-off style machine that gripped each container individually. While the lift-off machines are effective, they operate at slow line speeds and have extensive, and costly change part requirements. This sweep-off style depalletizer that has proprietary features to maintain container stability while depalletizing at higher speeds and efficiency. 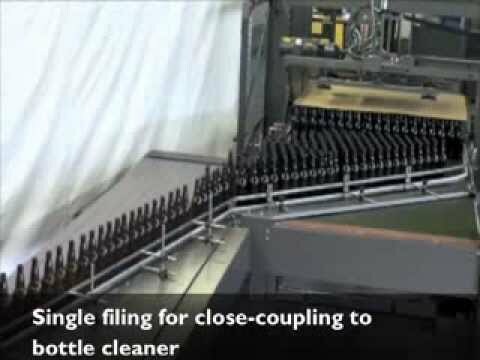 Rather than lift bottles from the pallet, this machine sweeps them by layer to the discharge table, maintaining bottle stability throughout the process. In addition to the new features to ensure bottle stability, this machine also includes A-B-C's exclusive layer squaring device that provides complete control of both the primary and secondary layers before and during sweep-off. The electric variable speed controlled motor provides smooth and gentle sequential operation to further ensure bottle stability. Changeover from one container style to another can be completed in minutes utilizing the intuitive operator station, and no change parts are required. A-B-C introduces the Model 49 decaser that automatically unloads and single files reverse tapered glass bottles from club store display cases, providing a simple and versatile means for wine and spirits bottlers to supply this growing market with display-ready product. The Model 49 also unloads standard bottles from RCS and HSC cases, providing maximum versatility for all market requirements. 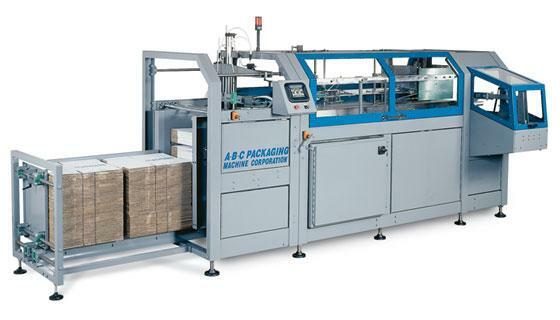 A hybrid of two A-B-C decaser models that are proven in production, the Model 49 gently unloads and single files reverse tapered bottles at high speed up to 50 cases per minute (300 bpm in both 6 and 12 pack configurations) utilizing a single filing section with a series of multiple tabletop chains that easily separate the bottles at high speed while maintaining complete bottle control and stability. The Model 49 has special features to unload half depth display cases containing full height partitions with ease, making this machine an economical alternative to lift-out uncasers that cost twice as much. As cases are lifted from the bottles, they are transported by motorized belts backed by duro-soft rollers that adjust to variations in case and partition dimensions and ensure secure and easy transport. After the bottles are unloaded, the major case flaps are folded back to pre-break the scores, reducing the flap spring-back memory thus conditioning the flaps for case packing and resulting in a more efficient case packing operation.